There can be few people as busy as Eben Upton. As the person most credited with bringing the Raspberry Pi into existence, he's been at the heart of its delivery; overseeing the minutiae of its design, its production and its incredible rise to mainstream recognition. At the same time, the foundation has moved manufacturing to Wales, launched both the Model A and a camera module, and continues to push the Pi into new territories. In between fielding requests from potential partners and international media outlets, he was able to spare us a couple of hours for an interview. He discusses everything from the project's inception to the difficulty in taking on the establishment. Linux Format: How difficult has it been to adapt to the success of the Raspberry Pi? 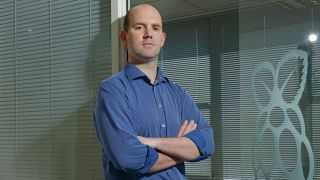 Eben Upton: I think a lot of the heavy lifting in terms of the logistics and the scale has obviously been taken on by RS and Element 14 (the two manufacturers of the Raspberry Pi). LXF: Had you always planned to use them? I think it was the point when we released the first SDCARD image for the device and we had 50,000 downloads, or the buggy alpha quality operating system from the team of people who didn't know whether it was going to exist yet, that was the point where we realised we were in trouble [laughs], and that we needed to think again about our model. LXF: This is at the end of 2011? EU: Yes, so if we'd stuck with our original model I think we would have spent the whole of last year dealing with the first day's demand. While it felt like we spent the whole of last year dealing with the first day's demand, we actually only spent 3 to 4 months. We certainly wouldn't have got anywhere - we might have got to 100,000 in our first year if we were really lucky, instead of being able to get to a million scale. So from Raspberry Pi's point of view, I think we 'magicked' away quite a lot of the scale by handing over to these organisations who were all about scale. I mean, those are around the scale of Amazon's logistics operations. RS say they ship 44,000 packages a day. So although this is significant volume for them, it's not close to doubling their volume. LXF: The launch was an event! EU: Yes, absolutely. I think we'd been living it for maybe 9 months and they [RS and Element] had only been living it for a month or two. LXF: Liz (head of communications for the Raspberry Pi Foundation and Eben's wife) also did a good job of building anticipation. EU: Absolutely, so I think it was a surprise for them. I think it turned into a very good surprise for them - it has become a good bit of business for both companies and you can see they've both been growing. I think there are scaling things for us. It's changed our view of what it is we're trying to do, and that's been the challenge for us. LXF: And what about on a personal level? EU: Certainly there is a sense… I wouldn't say it's less fun, but it's more serious. Because there are people whose jobs depend on this. It was never the idea for there to be people whose jobs depended on this, and not people here but people who make them and the people who distribute them.